The National Curriculum starts at Keystage 1 (Year 1 and 2 in the infants) and continues through to Keystage 2 (Years 3-6 in the juniors) and on into secondary education. It builds on the learning that has gone on in the foundation stage. Schools have a statutory responsibility to fulfil the requirements laid out by the National Curriculum. Copies of the National Curriculum are held in the office and are available to see by arrangement. Schools are expected to make provision for Personal, Social and Health & Economic Education as an integral part of school life. These subject areas form a broad and balanced curriculum. 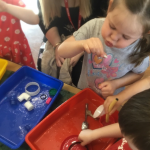 The subjects are not always separated but may be integrated, as children may be learning or practising more than one skill through one activity. Activities planned will cater for different abilities within the class by adjusting the activities or by the expected outcome. We use a topic approach as a framework for planning and teaching the national curriculum. The topics enable children to develop key skills whilst covering important curriculum content in a more interesting and cross curricular way. Each year group plans the topic that they are going to teach each term. The skills and knowledge taught come from the National Curriculum and are organised in a cross curricular way to incorporate learning in Science, Geography, History, Design & Technology, Art and PSHE (Personal, Social & Health Education). Links are made to Literacy, Maths, RE, PE and Music when possible. Where there are no clear cross curricular links, subjects continue to be taught in a discrete way.